These large to very large marine birds are characterized by the possession of irregular spiny projections along the tomia of the long beak, extremely thin walled bones, and a highly derived morphology of the humerus. They occur in late Paleocene to Pliocene deposits, and appear to have already achieved a global distribution in the early Paleogene. Among the earliest and most substantial Paleogene remains of bony-toothed birds are three-dimensionally preserved bones, which Bourdon (2005, 2006) reported from the late Paleocene/early Eocene of the Ouled Abdun Basin in Morocco. Bourdon (2006) distinguished three species of Odontopteryx from this locality, one of which she referred to O. toliapica Owen, 1873; the other two represent undescribed new species. Harrison (1985) described a partial mandible from the late Paleocene of England as Pseudodontornis tenuirostris, and another jaw fragment from the latest Paleocene of Kazakhstan was described as Pseudodontornis tshulenis by Averianov et al. (1991). Although these specimens are clearly from pelagornithid birds, their taxo-nomic distinctness is questionable, since little is known on the intraspecific variability of the "bony teeth" in pelagornithids. Bony-toothed birds are comparatively abundant in the early Eocene London Clay of the Isle of Sheppey, and the first specimens of pelagornithids were actually found in this locality. Unfortunately, a revision of the London Clay Pelagornithidae by Harrison and Walker (1976b) resulted in formidable taxonomic confusion. Although these authors identified several wrongly classified fossils from the Isle of Sheppey as bony-toothed birds, altogether they distinguished six species in five "genera" and three "families" for the pelagornithids from this locality. This result was rightly considered "completely unrealistic" by Olson (1985, p. 195), so much the more so as many species were based on noncomparable skeletal elements. In fact, all London Clay pelagornithids can probably be assigned to three species (Fig. 6.7): the smallest of these is O. toliapica, which is the first bony-toothed bird recognized as such (Owen 1873). A somewhat larger species was described as Macrodontopteryx oweni by Harrison and Walker (1976b) (see also Owen 1880), but may actually also belong to Odontopteryx (Warheit 2002, p. 53). Finally, there is a very large species, more than twice the size of O. toliapica, with a complicated taxonomic history. This species is known from various skeletal elements, virtually all of which were assigned to different species by Harrison and Walker (1976b, 1977). As shown by Mayr (2008g), all of these specimens should be classified as Dasornis emuinus (Bowerbank, 1854), with Dasornis londinensis Owen, 1870, Argillornis longipennis Owen, 1878, the alleged procellariiform Neptuniavis miranda Harrison and Walker, 1977, and possibly also Pseudodontornis longiden-tata Harrison and Walker, 1976 being junior synonyms of this species. Remains of medium-sized Pelagornithidae were further found in the middle Eocene of Belgium (Mlikovsky 1996c; personal observation). The putatively grui-form Zheroia kurochkini Nessov, 1988, which is based on a worn distal tibiotarsus from the late Eocene of Kazakhstan, may also be a representative of the Pelagornithidae, of which partial mandibles were found in the type locality of Z. kurochkini (Nessov 1992). From the middle Eocene of Nigeria, a very large fragmentary sternum was described as Gigantornis eaglesomei by Andrews (1916). The pelagornithid affinities of this specimen were recognized by Harrison and Walker (1976b), but the exact phylogenetic affinities between Gigantornis and Dasornis, whose sternum is unknown, still need to be determined. Remains of a large pelagornithid species were also reported from the middle Eocene of Togo (Bourdon 2006). The earliest fossil record of a pelagornithid from the Pacific Basin is a fragmentary distal humerus from the middle Eocene of Mexico, which was tentatively referred to Odontopteryx (González-Barba et al. 2002). Olson (1999a) described remains of the Pelagornithidae from the early Eocene of Virginia, and Goedert (1989) reported specimens of giant pelagornithids from the late Eocene to early Oligocene of Oregon, which possibly belong to Dasornis ("ArgiUomis"). Stilwell et al. 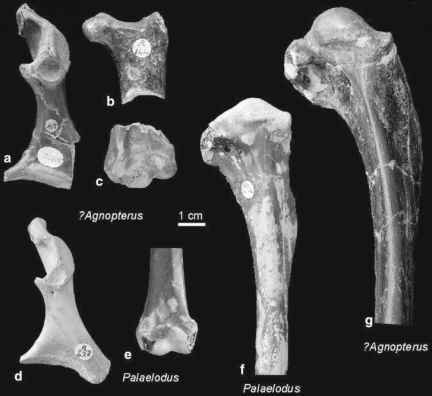 (1998) further assigned a fragment of a humerus shaft from the middle Eocene of East Antarctica to the Pelagornithidae (see also Jones 2000). Pelagornithids are also known from the late Eocene of the La Meseta Formation of Seymour Island (Tonni and Tambussi 1985; Tambussi and Acosta Hospitaleche 2007). Compared with this fairly extensive Eocene fossil record, few remains of the Pelagornithidae were found in Oligocene deposits. 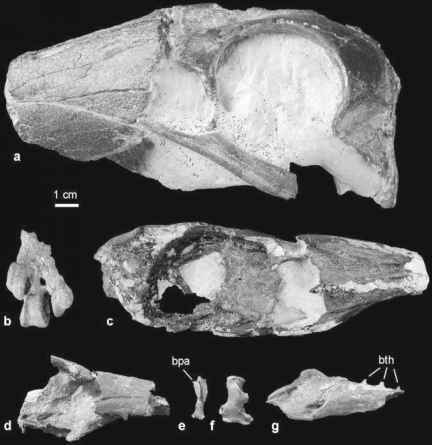 Caspiodontornis kobystanicus Aslanova and Burchak-Abramovich, 1982 from the "middle" Oligocene of Azerbaijan is based on a largely complete skull with a length of 30 cm (Aslanova and Burchak-Abramovich 1999). Aslanova and Burchak-Abramovich (1999) emphasized the fact the specimen is strongly flattened dorsoventrally, which is however likely to be an artifact of preservation. As noted in the preceding section, C. kobystanicus may be a junior synonym of Guguschia nailiae from the same locality, which was misidentified as a swan. Remains of unnamed species of bony-toothed birds also occur in the Oligocene of Japan (Okazaki 1989, 2006). Palaeochenoides mioceanus Shufeldt, 1916 and Tympanonesiotes wetmorei Hopson, 1964 from the late Oligocene of South Carolina are further representatives of the Pelagornithidae (Olson 1985), but the exact taxonomic affinities of these species still need to be clarified. Some peculiar skull features of pelagornithids are related to the unique bony projections along the tomia of the long beak. For example, there is a pair of distinct furrows along the ventral surface of the upper beak, which bear marked pits for reception of the "bony teeth" of the mandible. The high jugal bars and the strongly ventrally projecting palatine also seem to be functionally correlated with the specialized feeding technique of bony-toothed birds. Zusi and Warheit (1992) remarked that the mandible of these birds had an intraramal joint and lacked a fused mandibular symphysis. Pelagornithids probably captured their prey, larger fish or squid, near the water surface. Virtual endocasts of the skull of Odontopteryx were studied by Milner and Walsh (2009), who found the brain of this taxon to be similar to that of extant seabirds. Despite the wide temporal and geographic distribution of pelagornithids, many aspects of their postcranial skeleton are still insufficiently known, because the fragile bones are often fragmentary or badly crushed. Much new information was gathered by Bourdon (2006), who studied one the most comprehensive samples of pelagornithid bones found to date. Still, however, the results of this study await formal publication. Pelagornithids had very long and slender wing bones and short legs. The proximal end of the humerus exhibits a peculiar morphology, which prohibited rotation of the bone, and is indicative of a highly specialized mode of wing movement not found in other avian taxa. According to Olson (1985) at least the very large Neogene species were not capable of sustained flapping flight. In Gigantornis, the tip of the sternal carina exhibits a large articulation facet for the furcula. Among extant birds a similar syndesmotic or synostotic joint between furcula and sternum mainly occurs in larger soaring birds (Mayr et al. 2008). The pelagornithid sternum is further characterized by a large, steep-walled opening in the cranial portion of the visceral surface, and a strongly vaulted body (Mayr et al. 2008). Most earlier authors either assigned pelagornithids to the nonmonophyletic "Pelecaniformes" (Olson 1985; Olson and Rasmussen 2001) or classified them into the taxon Odontopterygiformes, which was considered closely related to both "Pelecaniformes" and Procellariiformes (Harrison and Walker 1976b). However, a cladistic analysis by Bourdon (2005) resulted in a sister group relationship between bony-toothed birds and the Anseriformes. Bourdon (2005) listed 12 apomorphies in order to support anseriform affinities of bony-toothed birds, including the presence of only two, instead of three, condyles on the mandibular process of the quad-ratum. As already remarked by Harrison and Walker (1976b), bony-toothed birds further possess the derived basipterygoid articulation of the Galloanseres. Moreover, the rostral furrow of the beak of pelagornithids is not homologous to that found in extant "Pelecaniformes" and Procellariiformes, and a position of bony-toothed birds outside Neoaves can be supported with the plesiomorphic absence of a ventral crest on the palatinum (Mayr 2008g). Comparisons with the Anseriformes were also made by previous authors (e.g., Spulski 1910), and at least one pelagornithid, i.e., P. mioceanus, was originally assigned to the Anseriformes (see Olson 1985); as noted above, this may also be true for the putative swan Guguschia nailiae. Anseriform affinities of the Pelagornithidae would be in line with the fact that the only other taxon with bony-tooth-like projections along the tomia is the moa-nalo Thambetochen xanion, an extinct goose-like duck that was described from the Holocene of Hawaii by Olson and James (1991). Certainly, however, more studies are needed to firmly establish the phylogenetic affinities of bony-toothed birds, so much the more so as Bourdon's (2005) analysis resulted in an unlikely (see Chap. 3) nonmonophyly of the Galloanseres. Paleogene representatives of the Pelagornithidae cover a size range from medium-sized (O. toliapica) to very large (D. emuinus) species, which probably had a wingspan above 4 m. By contrast, all Neogene Pelagornithidae had a giant size, reaching wingspans of 5-6 m (Olson 1985). Most likely, giant size evolved only once within bony-toothed birds, and the large Dasornis is the sister taxon of the giant Neogene Pelagornithidae, which can be united on the basis of a derived humerus morphology (compare plates 6 and 10 in Harrison and Walker 1976b). Although a phylogenetic analysis by Bourdon (2005) resulted in a sister group relationship between Dasornis ("Argillornis") and Odontopteryx, only the fragmentary humeri and ulnae of D. emuinus were included in this analysis. The two characters listed as apomorphies of a clade including Dasornis ("Argillornis") and Odontopteryx (an elongated pneumatic foramen on the humerus and an elongated ulnar tubercle for the ventral collateral ligament; see the caption to Fig. 1 in Bourdon 2005) may well be plesiomorphic for the Pelagornithidae.